The informed consent may be one of the most important dialogues that a surgeon has with the patient. Despite its importance, it is something that is not well taught or stressed in residency training. 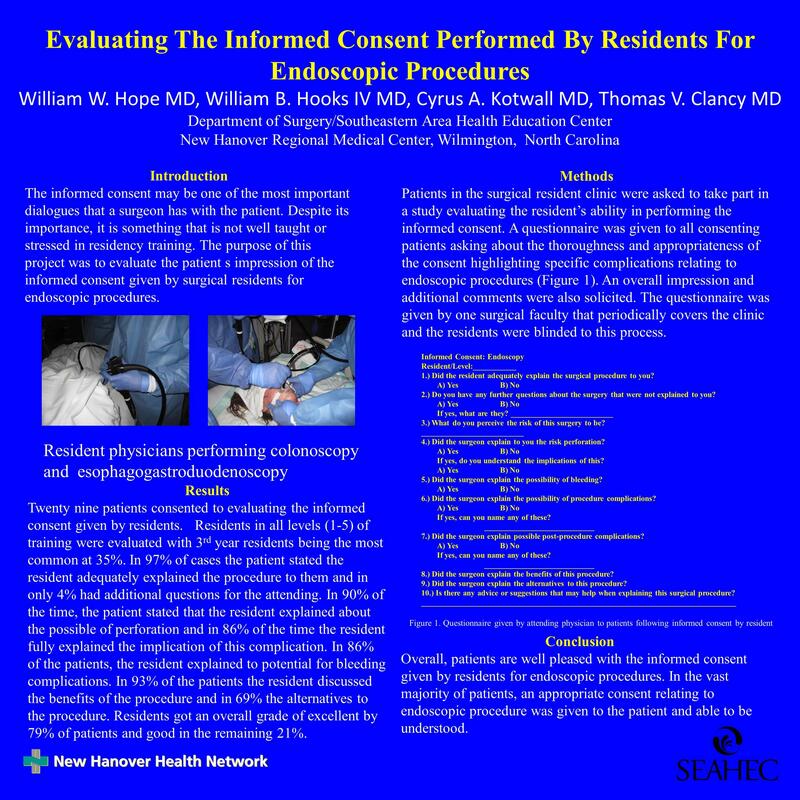 The purpose of this project was to evaluate the patient’s impression of the informed consent given by surgical residents for endoscopic procedures. Twenty nine patients consented to evaluating the informed consent given by residents. Residents in all levels (1-5) of training were evaluated with 3rd year residents being the most common at 35%. In 97% of cases the patient stated the resident adequately explained the procedure to them and in only 4% had additional questions for the attending. In 90% of the time, the patient stated that the resident explained about the possibility of perforation and in 86% of the time the resident fully explained the implication of this complication. In 86% of the patients, the resident explained the potential for bleeding complications. In 93% of the patients, the resident discussed the benefits of the procedure and in 69% the alternatives to the procedure. Residents got an overall grade of excellent by 79% of patients and good in the remaining 21%. Overall, patients are well pleased with the informed consent given by residents for endoscopic procedures. In the vast majority of patients, an appropriate consent relating to endoscopic procedure was given to the patient and able to be understood.